Well, I am hoping that this car faring society will be able to help me on this on. 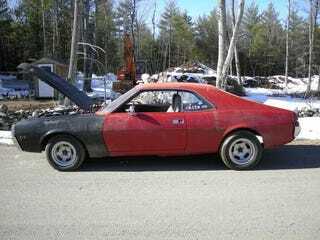 I am looking at a 68 javelin, and I was wondering if I should buy it or not... Give a car enthusiast some advice. Here is the deal; 4500 obo (would prob go 3500-4000) for a car that has a rebuilt 343 engine in it, and all of the mechanics has been gone through. Paint is iffy, but it has a 4 speed transmission that I would love to have some fun with. Guy says that interior could use some work, as well as obviously the exterior. But, as we all know, cars are useless without purpose. I am kind of 17 years old right now... sooooo yeah...(would be a daily) I don't know a lot, but if you check out my other articles, I keep up with some news. I watch MT, Drive, C&T, and a bunch more youtube channels. I don't know if the rebuild requires leaded fuel, and my father is yelling at me to not even look at it because of part problems. I currently own a family car, errm, (honda civic), but have never really fallen in love, even though it is a 5 speed. People have some cars that they like, and most are expensive. However, this model is my favorite type of car ever made, aside from an amx variant, so I kind of have a bias towards any condition problem. I live in the north east, so you can take that into account. Of course if I go and see it, I have to check for the usual stuff, and I am not buying a crap car. So, what do you think? Should my dream car stay that, just a dream? Or should I go for it and have a good time with it? I am also wondering if parts would be as bad as they seem. Thanks. Rust- A GM only sort of thing? Are cars getting too complicated?